Keen-eyed beauty magpies will have spotted the chrome nail trend appearing every now and then on Instagram. If you’re not clued up about this recent development, here’s the gist: nail technicians and bloggers are using a metallic powder which, when applied using a foam-tipped eye shadow applicator, produces a truly eye-catching mirror effect on the nail. This product is not only easy to use (I got the effect right first time), but it eliminates the need for fiddly nail wraps which crease and crinkle at the slightest misapplication. 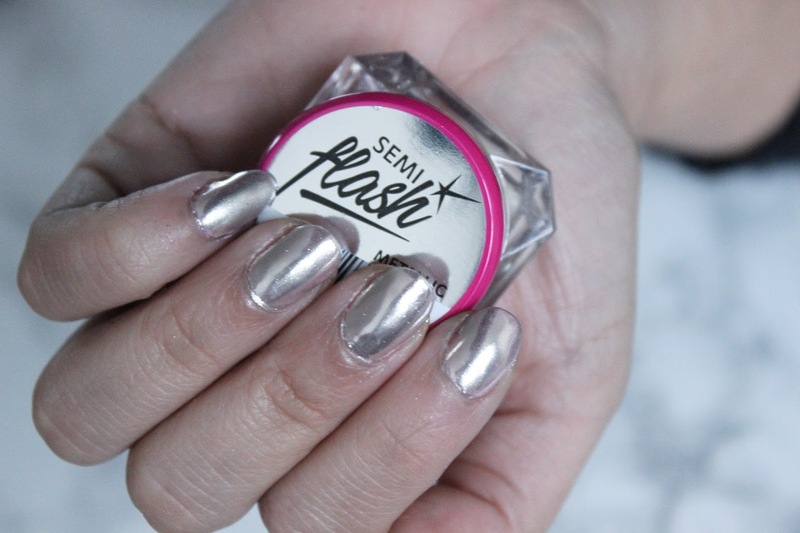 Semilac, a brand which you may have seen me work with before (see my video here), has created its own version of this powder called ‘Semi Flash’*. Available for £8.99, this little pot of powder will last you countless applications; all you’ll need is a no-wipe gel top coat and an applicator (I found some in Superdrug for £1.89 a pack). The effect is just stunning, and whilst wearing the product on my nails I received so many compliments – so naturally I was very happy with how it looked. To apply the product, I began with my normal gel manicure, pausing the process after curing my gel colour under a UV lamp. I then dabbed the tip of a foam applicator in the Semi Flash powder to create a thin layer, before lightly rubbing the powder in small circles onto the surface of my nail. It wasn’t long before the effect became visible. I only needed one layer for the chrome shine to become opaque and completely cover up the colour underneath, so each nail took around ten seconds to complete! To finish off, I applied a UV gel top coat and placed my hand under the nail lamp for a final cure. As expected, some powder residue was left on the skin around my nails, but I was able to easily remove this with a cotton bud and some rubbing alcohol. Around three days in, I noticed some small chipping around the very tips of my nails, which could have possibly been avoided with better top coat application on my part. However, overall, the powder lasted as long as my gel coat. As the gel started to peel off around the ten-day mark, the powder came off with it, so I removed the polish and left my nails to breath for a day – but I was longing to recreate the effect again, and so I applied the powder again the next day! I used the Semilac Semi Flash on top of a light pink gel nail polish; however, as Semilac states on its website, the appearance of the powder alters when applied over a range of varying shades. I’m yet to apply this over a more vibrant colour – a metallic cherry red would look perfect for Christmas – but I will keep you updated on my Instagram when I do!